Big Dope made me sit through a political speech recently in which a candidate hinted that, if elected, he would work to eliminate any regulation of the environment. 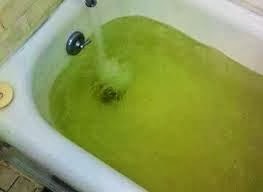 Today I ran across this photo of the public drinking water in Charleston, West Virginia—a result of what you call “unfettered capitalism,” in which those of the libertarian faith so strongly believe. I am more confused than ever. Can someone help? Don't forget to check out Big Dope's book, The Charmed Time.